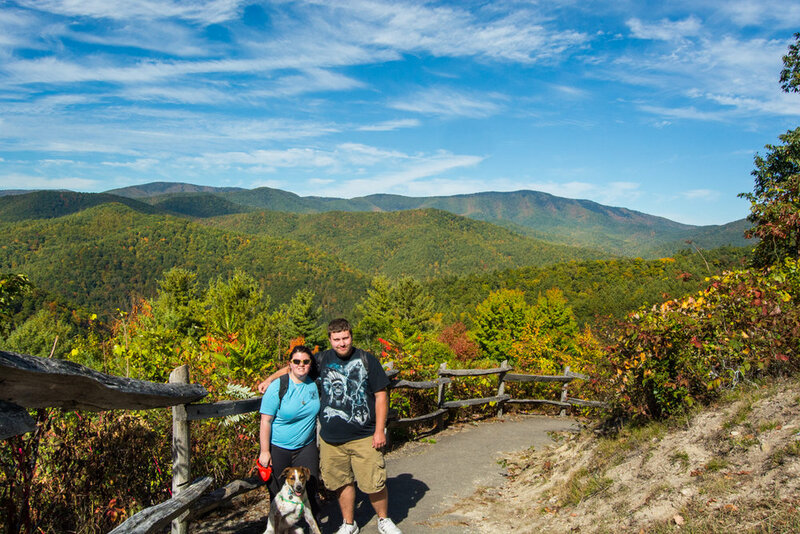 On our first day of seeing North Carolina we wasted no time and immediately made our way to the Great Smoky Mountains National Park in Catalooche. When we first entered the park it was nothing like we have ever seen before. The road into the park was very narrow and barely hanging on the side of a cliff. Not to mention the dangerous holes that we couldn’t see in the road. Funny enough, the car in front of us also had a “Just Married” decal on the back of their car. We followed close behind them since we couldn’t see when the next tight turn was coming. It seemed to take forever when we finally found a main road to follow. We felt much safer on there. Don’t get me wrong, I’m up for any adventure, but looking over the edge of those mountains could put some real fear into anyone. Especially since we didn’t know if another car was coming around a bend the same time as us. We decided to keep following the newly weds in front of us, hoping maybe they actually knew where they were going since we didn’t really pre-plan our trip there. They led us to a small parking lot where we also pulled in. Their “Just Married” decal and our “Just Hitched” decal made everyone’s heads turn. 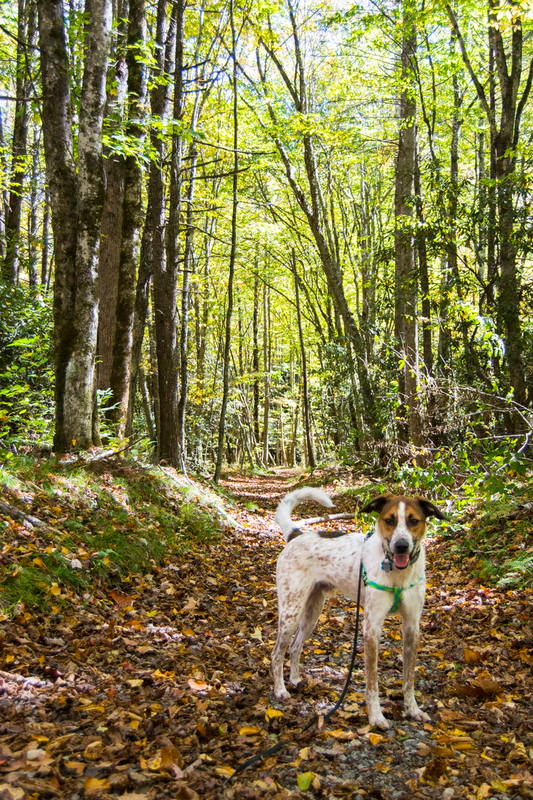 We suited Rusty up in his harness and followed some people up to a small trail. 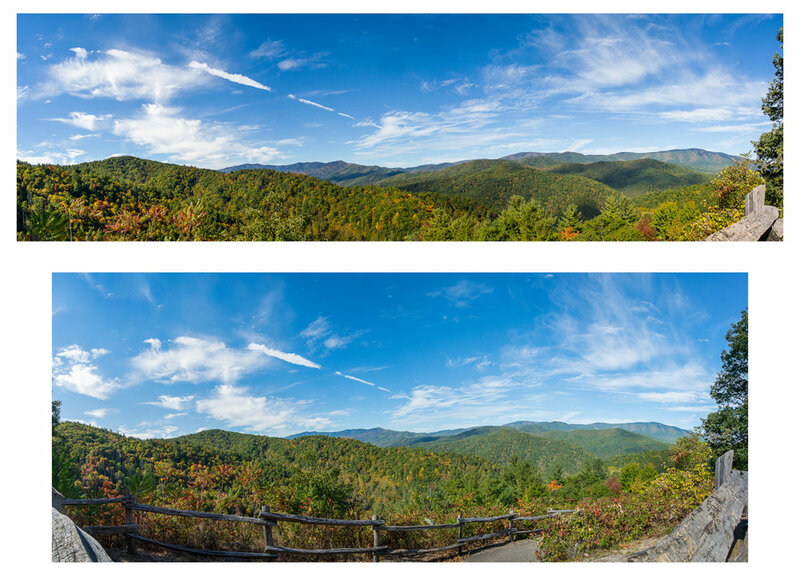 That’s when we saw the sign that told us we were about to see the overlook of Cataloochee Valley. It gave us a little bit of history about Cataloochee Valley, but not much else was written on the yellowing sign. We made our way up the little trail and about half way I was getting excited. I could just see the tips of the mountains and I knew what we were about to see was going to be amazing. When we reached the top there were only a couple other people taking in the view. When I turned around, tears started to fill my eyes. Here I was, finally in North Carolina, where I always wanted to visit, and now here I am looking at a gorgeous scenic view I never wanted to leave. The mountains seemed to go on forever. The fall colors were vibrant and the sky was a deep blue. Just feeling the wind and seeing all the beautiful nature in front of me was a dream come true. I took a moment to just stand there and take it all in before I started photographing. While I photographed, my husband stood by and let Rusty say hello to anyone around us. If I could build a house somewhere, I wouldn’t mind it right there. My heart was filled with such happiness, I seriously didn’t want to leave, but I knew we wanted to see more. After spending some time at the overlook, we decided to hop back in the car and see what else we could find. We drove down the road for a little while and saw a parking area right next to a trail. I got out to see maybe if there was a map near by before we just started walking. That’s when I saw that dogs were not allowed in the Great Smoky Mountains Park. I was really upset because we didn’t want to leave Rusty at home We wanted to take him hiking with us since it’s something he really loves. We decided to keep driving and see if we could find somewhere we could take him for a little. 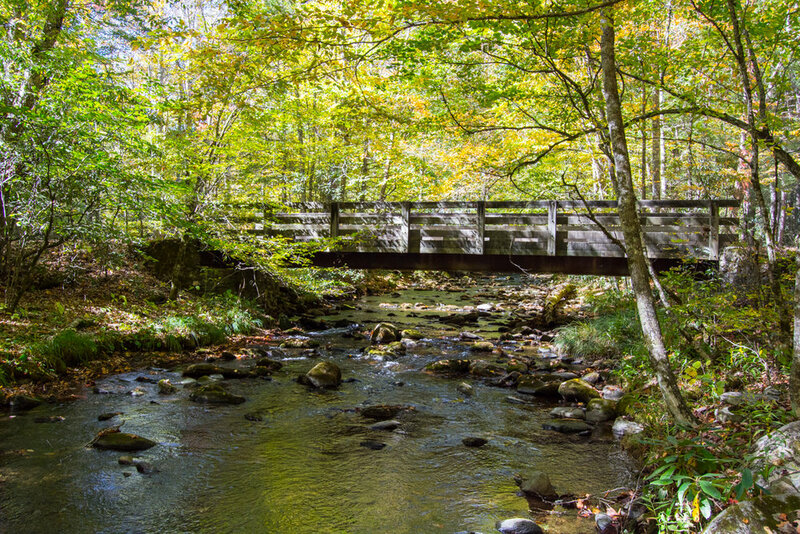 That’s when we ended up down in Cataloochee Valley. While we were driving we came to a stretch of road where cars were parked off on the side between two open fields. I got excited because something must have been around. In all honestly, I was hoping it was a bear, but in the far distance, in the shade, we could see some of the elk that roamed the park. We even spotted a baby with its mother. Even though they weren’t bears, it was still pretty cool to see. We even saw a flock of turkeys on the other side heading into the woods. After seeing them, we drove farther up the road and right as we got into the trees again, we parked right by the Palmer Chapel. It was a nice open area where we weren’t too deep into the woods and we figured Rusty would be okay. There was a creek nearby, so we walked along there for a little while so I could get some pictures and Rusty could stretch his legs. We met some very nice people along the way. We walked down the dirt road and saw the chapel and some more fields. My favorite part was when we decided to walk along a horse trail. It was a nice walk on a beautiful day. 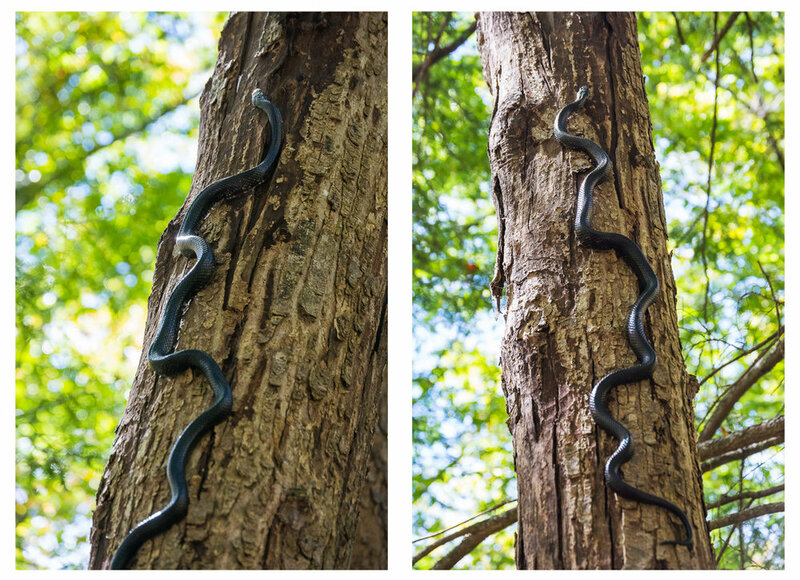 Although I didn’t get to see any horses, we did happen to see a huge black snake climbing a tree. From my research I’m thinking it was a Black Rat Snake. Non-venomous, but this one was pretty long and I wasn’t going to mess with it. He was far up the tree so I’m sure he didn’t even notice us. It was still amazing to see even though Brian was screaming to get away from it. After watching the snake disappear up into the tree, we continued on the trail. 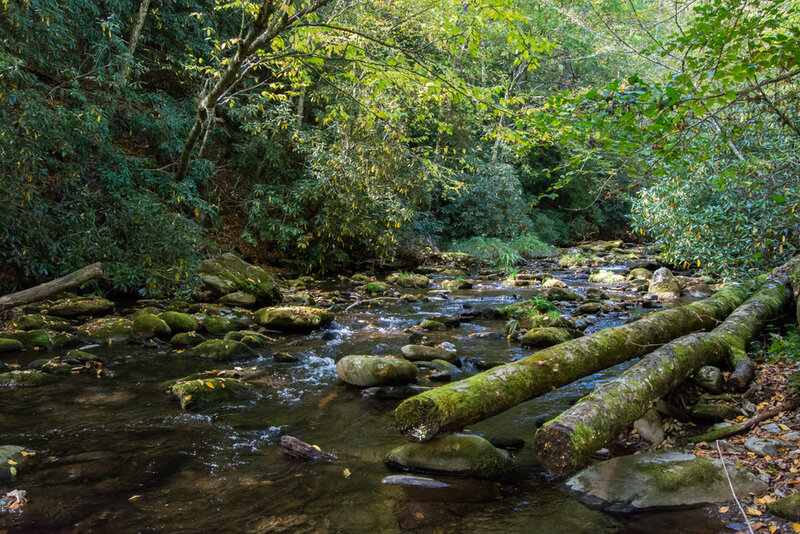 We stopped at various spots of the creek to take in the beautiful views. I was daydreaming already about moving to North Carolina. I couldn’t get enough of all these wonders. Driving back we took a different way out to see if there were anymore more sights to see. We drove through two different fields where there was an abandoned barn and people parked off the side having picnics it seemed. We slowed down to see if there was any more elk or anything, but there was nothing. The only thing we could think of was that all the people who were relaxing in chairs or in the back of their cars knew that some wildlife came through those fields at a certain time of day and they were just waiting for them. We didn’t stay though. There were some other things we wanted to do that day. After finding our way out of the park we went and dropped Rusty off at the cabin and made our way to a local gift store we saw in passing. I was so excited because they had a pressed penny machine, but go figure when we got there it was out of order. Nonetheless, we decided to walk around and see all the things they sold. There were two buildings. The main shop was called Maggie Mountaineer Crafts and then there was a little store right next to them, which I believe was the same owners, but it was called A Day in the Valley. It smelled like heaven walking around there. There were fresh apples right outside, pumpkins, cider, fudge, and candy everywhere. Right in between the two buildings was a little pathway to the back where there was a relaxation spot. They had a little patio with some chairs right by a small creek. It was simple and beautiful. We didn’t sit though; we wanted to see what interesting things they had in the shops. If anyone knows me well, I love souvenirs. They had some really amazing things there. Some beautiful décor pieces. I had to keep moving because I swear I would have left with the whole store. 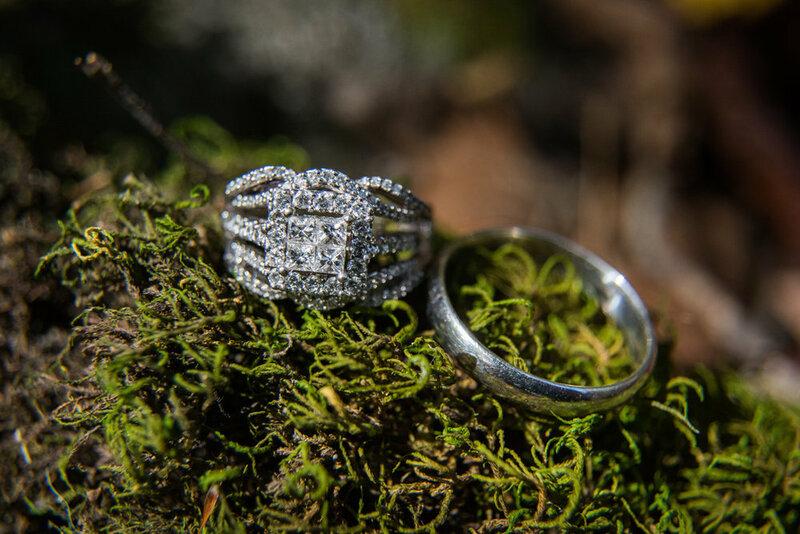 After looking around for a little while in Maggie Mountaineer Crafts, Brian and I finally gathered a couple things we wanted. 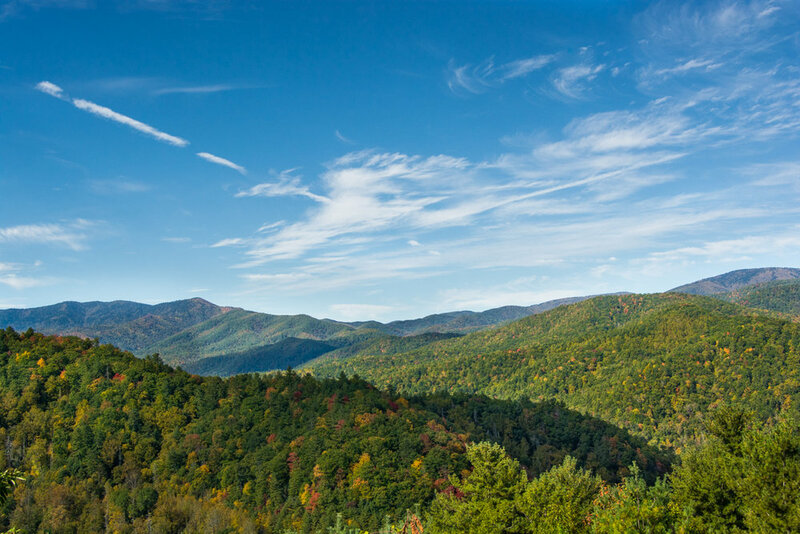 I got a magnet with pictures from Great Smoky Mountains Park and a maroon shirt with the famous saying, “The Mountains are calling and I must go” by John Muir. It’s one of my favorite sayings. Brian got a steel water container and a thing he calls the ball and cup game. Don’t ask me, he was all excited to get it. We also got some things for our families for Christmas. We got Brian’s parents a North Carolina calendar and for my mom we got her a Maggie Valley, NC mug with butterflies on it. Of course I got a piece of candy as well and Brian tried a piece of their famous fudge, which he highly recommends. When we stopped next door at A Day in the Valley, nothing too much caught our eyes. We did end up getting an ornament for our first Christmas as a married couple and then a beautiful blue wine stopper for my brother and his wife. It wasn’t until we were about to leave when something caught my eye. On the top of two shelves I could barely see what I thought was some horse statues. But these weren’t any horse statues to me. I collect the figurines from the collections: Horse of a Different Color and Trail of Painted Ponies. Sure enough, I knew they were from those collections because one was definitely on my wish list. I immediately asked the lady if they were for sale and when she said yes I wanted to cry! It might sound silly, but the reason I was so excited is because you can’t find these statues in stores. I usually have to order them online. It was hard to decide which ones I wanted. One was for sure I had to have the one with the dreamcatchers on it. I finally narrowed the other one down to the one of the mother and the foal. I made sure to note to Brian that if we come back again we will have to see if the others are still there. After our little gift adventure, we decided to head home and make some dinner. We stayed in that night and just watched some TV and I cross-stitched while we relaxed with our little man. I even looked up the reason why they didn’t allow dogs in the Great Smoky Mountains Park and I found out it was just for safety. Since there are bears and other predators they don’t want our family pets to get harmed or for them to harm nature itself, which is understandable. After reading that we decided to actually plan out our days for the rest of the week. 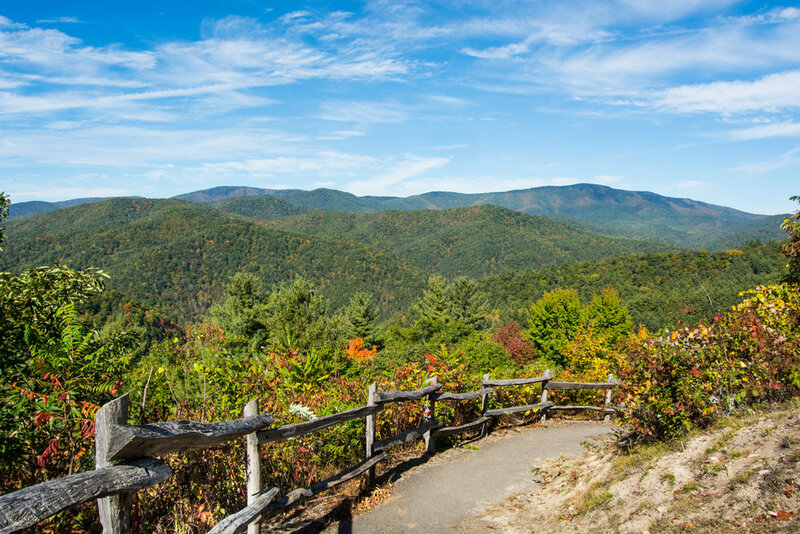 Next adventure, a zoo and Asheville!